Update: We will no longer be offering TimeTec Web Trial. Please go to TimeTec Cloud for the 30-day FREE Trial version. Setup the physical server accordimeng to the recommended technical specifications. Ensure the Windows OS has up-to-date hotfixes and files. Connect the physical online with Fixed IP address. Install/manage the web services components/files in the Windows OS. Install TimeTec and connect it with the MySQL database. The System Administrator is the person with full access to all modules/sections of Time Tec to setup/run the system. He/She must go through a full training session in order to handle and operate TimeTec and to process attendance and reports. We recommend the Administration or the Human Resource Manager to act as the System Administrator during the trial period. 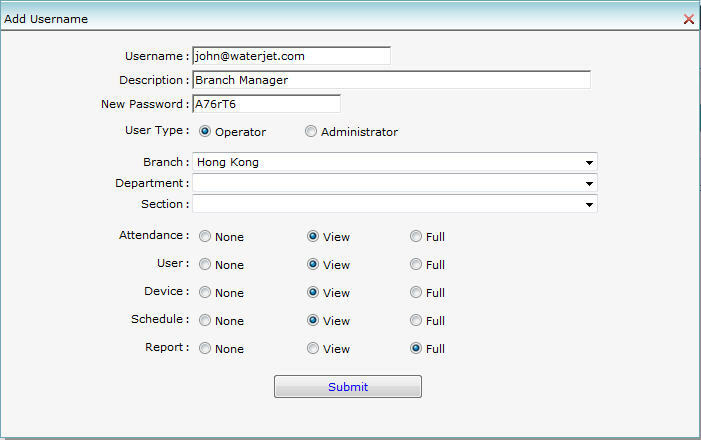 A System Operator is the person who can access TimeTec to configure working rules/calendar and process attendance records. 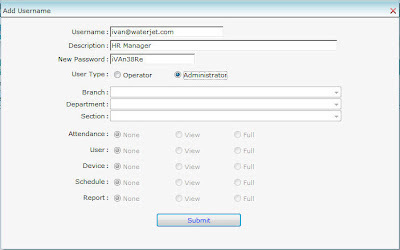 He/she can preview/print/save reports for all employees. This refers to the person with the authority to view the records of users assigned under specific branch or department. He/she can preview/save/print reports of those under their supervision. We recommend the Branch/Department manager from each department to be assigned with this authority. 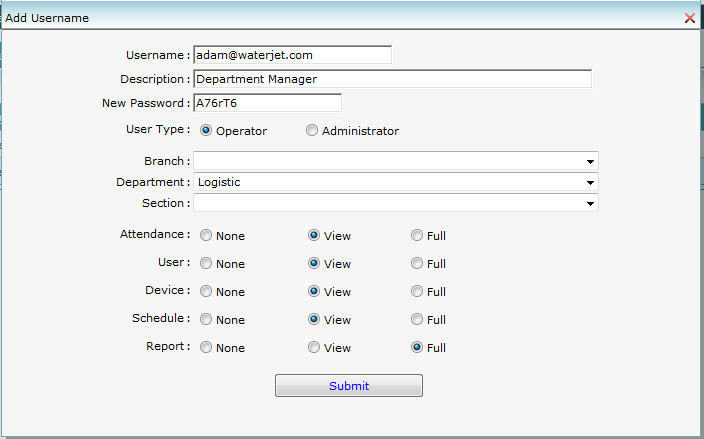 Two persons from each department should be assigned to report attendance at the FingerTec terminals to generate records in TimeTec. We recommend each test person to follow individual working schedule/calendar to represent different working scenario. However if you are doing a in house testing with the TimeTec Web, you will only require the System Administrator and test person from each branch/department/different working scenario. 1. Prepare physical server with fix IP address as Test Server. We recommend to use Windows 7 Professional 64-bit, with 8GB RAM to achieve optimum performance during testing. The fixed IP address is important because you will need to insert it into each test terminal as the Webserver IP address. In the event that you do not want to apply/purchase a fixed IP address, you still can run the tests. Simply install the physical server with a static IP address. The server will connect to FingerTec terminals on the same Local Area Network (LAN). You can use the server’s static IP address as the Webserver IP address. You can only run tests within the same LAN with this configuration. Kadex *Upon request. Prices for TimeTec/ Webster enabled Kadex may vary. Any models that are not listed above will not work with TimeTec Web. Please choose your terminals accordingly. 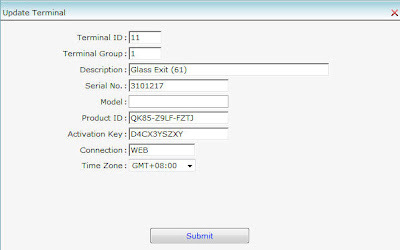 Visit http://tips.fingertec.com > Download > Firmware > Select the terminal to download the suitable firmware. 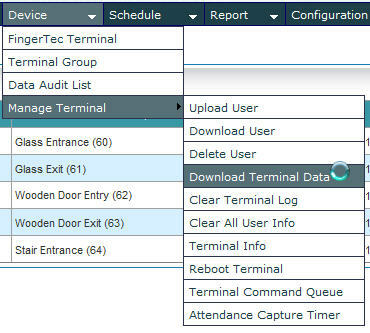 Update the test terminals with the latest firmware to make sure it is ready for testing with TimeTec. Insert the fixed IP into the Webserver IP address column and the Port as 8080. For those who are not testing with the fixed IP address server, please use the server static IP address as the Webserver IP address. 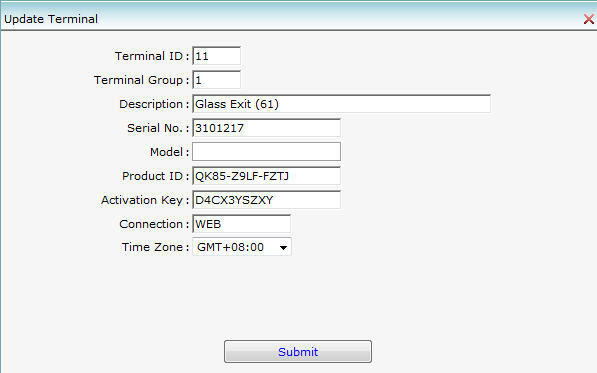 The Technical Department will then send the TimeTec Web trial product activation keys together with the firmware. 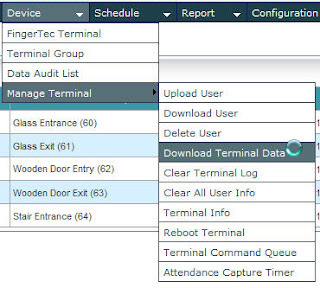 These key numbers are important for you to add and activate connection from TimeTec Web to your test terminals. The validity of each key will be for 3 months. It is reccommended that an MIS/IT specialist carry out the following steps. We strongly recommend to use the Windows 7 Professional/Ultimate 64-bit or Windows Server 2008 as the operating system. You can refer to the links below to download the related files to install your TimeTec Web server. Step 1: Add FingerTec terminals into TimeTec to establish connection. 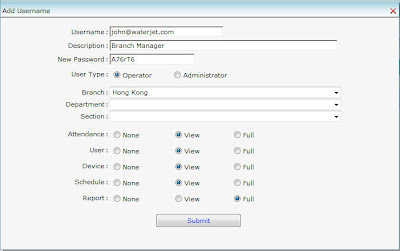 Step 3: Fill in the information for Branch/Department/Section at Configuration > Branch/Department/Section. Employee reports attendance at the FingerTec terminals to generate attendance records. 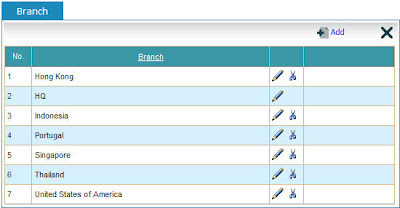 Administrator will then download the records into TimeTec and store it for attendance calculation. 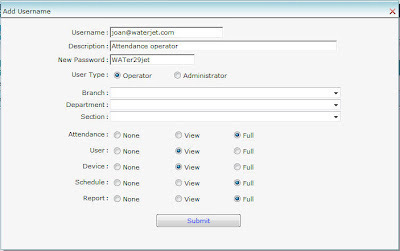 Step 1: Administrator/System Operator checks attendance in TimeTec Web > Attendance. 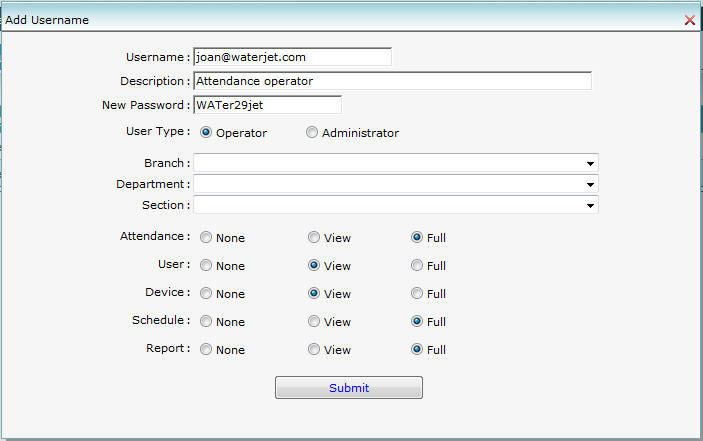 The administrator can edit attendance of employees accordingly. Step 2: The administrator previews and print the reports at Report. Select the type of report > Preview > Print/Save into digital format. Are FingerTec Models with WiFi Function Secure?